Fri., July 6, 2018, 2:54 a.m. When Patrick Seifert read a 2013 report from the Veteran’s Administration that said 22 U.S. veterans were committing suicide daily, it changed his world and inspired him to do more. Seifert, a veteran himself, owned a medical marijuana collective garden and safe access point called Rainier Xpress in Olympia. In 2016, he created Twenty22Many, a 501(c) 3 nonprofit that advocates for veterans with PTSD, promotes holistic therapies, alternative medicine and education, and raises awareness of veteran suicide. Its ultimate goal is to reduce the rate of suicides of veterans and active duty military. Seifert also uses the resources of his shop. Sometimes, he said, veterans come in seeking the right product to try and wean themselves off of pharmaceuticals and even alcohol. He knows what they’re going through because he also has first-hand experience with the healing potential of cannabis. He was in the Marines during the first Gulf War, but didn’t experience direct combat. But he does have PTSD due to sexual abuse as a child, and said cannabis has been able to help him overcome his demons. Seifert said he can often tell if a customer has PTSD just by looking at them. He knows that many veterans are scared and confused. They’ve heard that marijuana can help PTSD, but they’re not sure if it could be purchased or prescribed for their situation. There is also a fear that their military health benefits could be jeopardized if they are caught with cannabis. After creating the foundation, Seifert and other volunteers began to ask Washington lawmakers if PTSD could be added to the list of qualifying health conditions for medical marijuana. State Sen. Adam Cooper and then-Sen. Jeanne Kohl-Welles, now on the King County Council, drafted a bill to get PTSD listed as a qualifying condition, then handed it over to Sen. Steve Hobbs, who was the Senate version’s primary sponsor. Hobbs, a major in the U.S. Army National Guard, and commander of Joint Force Headquarters, Washington Army National Guard, was happy to help. Seifert said he appreciated that several veterans came to Olympia to testify before the Legislature when the bills were discussed, but said he would have liked them to have been given more time. “Talk about disrespectful, these guys were given two minutes to talk,” he said. The bill was eventually approved in 2015, and Washington became the 11th state to list PTSD as a qualifying condition. As of 2017, 23 states, two territories and one city list PTSD as a qualifying condition. Interestingly, Colorado, where recreational and medical cannabis are both legal, has not taken that step. Hobbs said even though cannabis remains illegal at a federal level, he doesn’t expect crackdowns on veterans using cannabis or removal of their benefits. Twenty22Many is run solely by volunteers, who provide many services including free yoga, kickboxing, arts and crafts, meetings and cinema night for veterans. It also runs a support line for suicidal vets. Although the support line volunteers aren’t mental health professionals, Seifert said some veterans are more eager to talk to someone with military experience who can better relate to what they’re feeling. The non-profit plans to bring in a counselor to better train the phone line volunteers. “If a vet ever says ‘I’m going to kill myself,’ we do everything we can to get them to a hospital,” Seifert said. Volunteers have also been reaching out to cannabis retailers around Washington for support. So far, about 40 medically-endorsed locations offer discounts and have agreed to put up stickers in their windows saying they’re part of the “Support Depot” program. This acknowledges that the store owners and staff are willing to provide a safe place and resources for veterans. Any veterans will be given a brochure sharing local, state and national info for any needs, and they’ll also be connected with a volunteer from the local community. If a veteran wants cannabis products, they’ll receive advice on what can help them relax or get them elevated and motivated. Twenty22Many now even has its own branded product: the “22 Rescue Vape Cartridge,” which provides a recommended blend of cannabis for daytime use and nighttime use. Seifert said the cartridge produces less of a “couch-lock” feeling and something more energizing. He and others are still collecting data to perfect the pen, but veterans have told Seifert that just having this tool with them makes them feel better in the event of a PTSD episode. Right now the vape cartridge is available in 20 Washington retailers, and Seifert hopes to expand its availability soon. 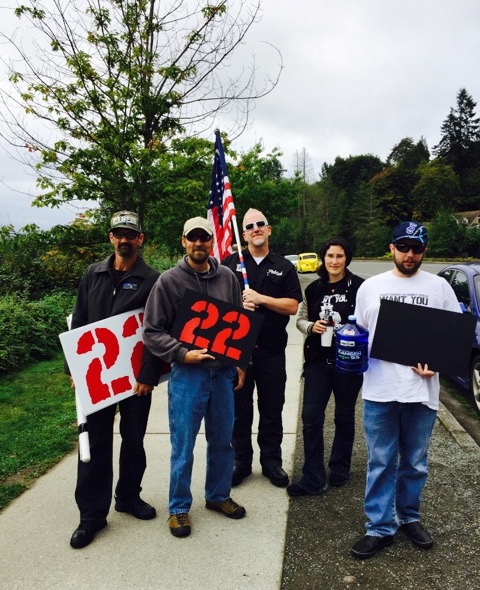 Twenty22Many has about 20 reliable volunteers but Seifert expects up to 500 people to take part in its fourth-annual PTSD and Veteran’s Suicide Awareness March in Olympia at 10 a.m. July 22. The march is intended to build support and unity. Sen. Hobbs said he attends every year unless he’s on active duty. The non-profit plans other fund-raisers and awareness events throughout the year. Volunteers will be at Hempfest in Seattle in August, and Seifert plans to visit Washington, D.C. to talk to national lawmakers about the benefits of cannabis. Twenty22Many volunteers have been awarded “volunteers of the year” twice from the City of Olympia for their continuing efforts in keeping parks and sidewalks clean. The organization also provides a safe haven and shelter for homeless veterans, spouses and pets. For more information, or to donate or volunteer with Twenty22Many, visit twenty22many-olympia.org. Published: July 6, 2018, 2:54 a.m.